We dealt with the pitch way back in Law #1, but a single rule can’t encompass everything related to something as wide-ranging (both physically and philosophically) as the field of play. So, the 9th Law of the Game deals with when a ball goes out of play. This occurs when a ball goes out of the pitch for a throw-in, corner kick, or goal kick, or into the net. As we have all heard asinine announcers exclaim more than one thousand times, for the ball to go out of play (or into the net), “the whole of the ball must cross the whole of the line”. The most famous ruling in this regard occurred during the 1966 World Cup when England was awarded a goal many historians think never crossed the entire goal line. Since there was no instant replay, I think we should all just let it go and give the Brits a break. You don’t get a break from our pop quizzes though. So, here is your question. In which of the following situations would the ball still be considered “in play”? A. When it rebounds off the referee’s face. B. When it is perched on top of the cross bar (ignore the physical impossibility). C. When it rebounds off the corner flagpost. It’s (D), All of the Above, which everybody should know by now because it is always All of the Above. One thing many folks don’t know though is that the Ninth Law of Soccer is probably the shortest in the entire FIFA rule book. It could be the simplest one too. In the picture above, I can’t see the ball, but I am guessing it is no longer “in play”. 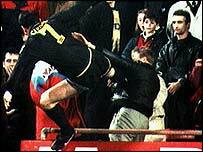 I am also guessing you don’t mess with Eric “Kung Fu” Cantona. I – unlike Cantona – always try to keep my balls in play, and I also try to keep them from bouncing off the referee’s face like in the pop quiz question above. Ouch. Sorry about that bit of juvenile humor. Come back tomorrow to learn about “The Methods of Scoring”. I am sure I will be able to behave like an adult for that whole discussion. Schwing!